And when ease of use, flexibility and management simplicity matter, the ZD420 ribbon cartridge printer is the easiest thermal transfer printer to load, period - so users can replace the ribbon and get back to work in seconds. The ZD420 thermal printers are loaded with features for easy use. They are the only thermal printers to offer both a standard ribbon and a ribbon cartridge model for fool-proof and split-second installation. The ZD420 also lets you know when the ribbon needs replacing. And, five intuitive status icons make it easy for your workers to see, at a glance, what is needed to keep your printer up, running and available. If you need new communication or media handling options in the future, no problem. 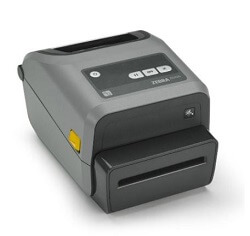 Add serial or ethernet connectivity, plus a peeler or a cutter, right on site — without taking the ZD420 thermal printers out of service. The result? Maximum functionality, uptime, value and return on investment. ZD420 printers run Link-OS and are supported by our powerful Print DNA suite which includes simplified remote management tools that make it simple to deploy large fleets of printers across multiple locations so you can now maintain, secure and troubleshoot printers from anywhere, at anytime – freeing up operations to focus on work, rather than printers. In addition to the innovative ribbon cartridge, on-site upgrades and just about every modern wired and wireless connectivity option, the ZD420 also comes with Link-OS. This unique software platform greatly reduces time spent integrating, managing and troubleshooting all of your printers — making your thermal printers more cost effective than ever.